September marks the change in seasons and we usually welcome the autumn colors — except when it’s red tide. 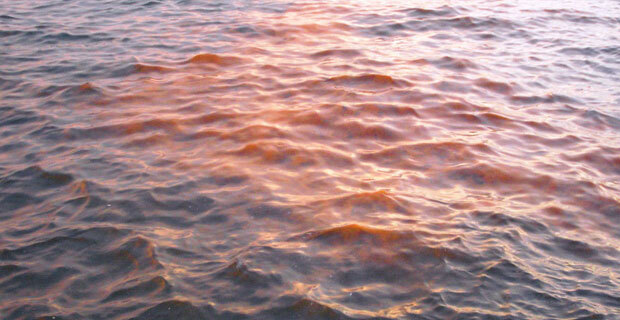 The Coast Guard is warning swimmers and boaters to stay clear of the red waters that have infiltrated New York Harbor. Also known as “red tide,” it signals the growth of potentially toxic algae which can cause irritation to the eyes, skin and breathing problems. The red tide is spanning from the Intrepid Sea Air Space Museum all the way down to the waters in our neighborhood. Although reports say that it was first seen at 7am this morning, we believe the red tide was first spotted yesterday by reader Jay Fine, who had posted images of the tide on our Facebook. The algae’s proper name is phytoplankton, which are known to steal oxygen supplies away from both fish and shellfish. Although most people don’t usually swim in the Hudson River down by our parts — sailors and people visiting the North Cover Harbor should not touch the waters if close enough to the red tide.